Buy beautiful designer Asian bridal sets & all the wedding accessories you need online. Our UK based experts will securely pack all your bridal jewellery. Buy the bridal jewellery of your dreams all stress free from Indian Jewellery Store with FREE UK, USA & Worldwide delivery! Shop the biggest bridal trends for 2019: Chokers, Pearls, LCT. 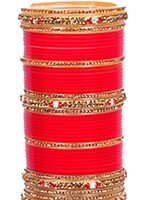 Wedding Accessories: Anklet (Payal), Churas, Hath Panjas, Kaleeray, Mangalsutras, Matha Patti, Nath, Turban Pin.